Christmas & Chill is the second holiday EP by American singer Ariana Grande. Republic Records released it on December 18, 2015, as a follow-up to her 2013 holiday EP Christmas Kisses and her 2014 Christmas single "Santa Tell Me". The EP features six original holiday tracks composed and produced mainly by Grande and co-writers, all of which have an R&B, soul and trap sound. On November 18, 2016, Christmas & Chill was released on CD in Japan. The EP sold 35,000 copies in its first week in the United States and 180,000 worldwide. According to Tommy Brown, the EP was recorded in 4 days at Grande's home studio. Songwriting credits are shared by Grande with Tommy Brown, Michael Foster, Steven Franks, Victoria Monet, Travis Sayles, Ryan Matthew Tedder and Peter Lee Johnson. For Rolling Stone's Brittany Spanos, the EP consists of "romantic Christmas ballads over trap beats", commenting that "the one song to stand out from the more R&B-leaning EP is the folky 'Winter Things', where the acoustic track sounds a bit like Jason Mraz, as Grande sings 'My baby's in town and we're gonna do some winter things'." Jaleesa M. Jones in USA Today called it "a festive ode to winter romance." Emma Garland from Noisey said the album "basically sounds like a Cassie album ... but with sleigh bells and lyrics like 'tis the season for some love giving!' It's basically the perfect festive romp." Two years after its release, MTV's Sydney Gore and Brian Anthony Hernandez revisited the EP, calling it "a new holiday classic" and "a catalyst of original Christmas carols for the so-called doomed millennial generation. ...[T]his EP has the power to melt any trace of snow that's piling up on your front porch. ... There's a playful, eflish energy about ["True Love"] that makes you want to hang mistletoe everywhere to secure a smooch with that special someone." 2. "Wit It This Christmas"
4. "Not Just on Christmas"
^ "Holiday Albums : Page 1". Billboard. Retrieved December 23, 2018. ^ a b "アリアナ・グランデ、日本のファンに贈るクリスマスミニアルバムを11月リリース". Billboard Japan (in Japanese). October 7, 2016. Retrieved October 7, 2016. 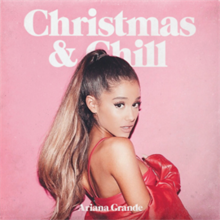 ^ "CDJapan: Christmas & Chill by Ariana Grande". Cdjapan.co.jp. Retrieved October 10, 2016. ^ "Ask Billboard: Ariana Grande's Sales, Kelly Clarkson's Streak & … Bernie Sanders' Sales, Too". Billboard. Retrieved February 26, 2019. ^ "Ariana's updated single sales worldwide!". ^ [EP&cat=a "Australiancharts.com – Ariana Grande – Christmas & Chill [EP]"]. Hung Medien. Retrieved December 26, 2015. ^ "Ariana Grande Chart History (Canadian Albums)". Billboard. Retrieved December 29, 2015. 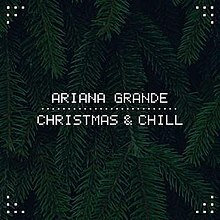 ^ [EP&cat=a "Swedishcharts.com – Ariana Grande – Christmas & Chill [EP]"]. Hung Medien. Retrieved December 29, 2015. ^ "Ariana Grande Chart History (Billboard 200)". Billboard. Retrieved December 29, 2015. ^ "Ariana Grande Album & Song Chart History: Holiday Albums". Billboard. Prometheus Global Media. Retrieved December 31, 2015. This page was last edited on 17 April 2019, at 18:42 (UTC).